The Acute Care Nurse Practitioner is a specialized certification. It enables the Nurse Practitioner to practice in a multitude of settings, providing care to adults who suffer from acute or chronic illnesses. The Nurse Practitioner with this certification can examine patients, order and interpret diagnostic studies, diagnose disease, and provide medical treatment. Specific limitations on prescribing privileges vary from state to state. 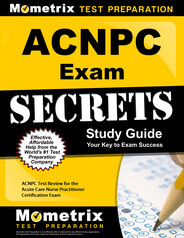 Prepare with our ACNPC Study Guide and Practice Questions. Print or eBook. Guaranteed to raise your score. Get started today! To become eligible to sit for the ACNP exam, a person must be a licensed RN and a graduate of an accredited nurse practitioner program with an acute care nurse practitioner track. The person must have a Master’s Degree in Nursing. Once the registration paperwork has been completed, there is a 90-day time period open for the ACNP exam to be completed. The cost ranges from $230-$370 depending on ANA membership and other possible discounts that can be applied. 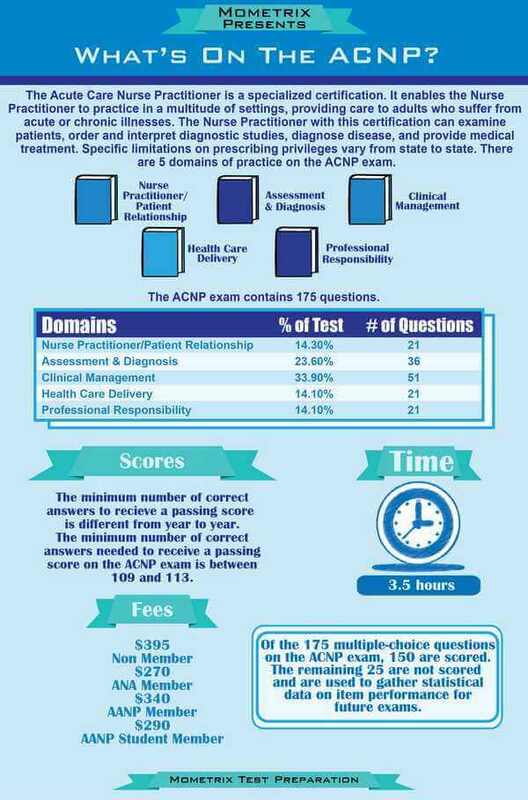 The ACNP exam contains 175 questions that are multiple-choice format. Of these questions, 25 are used for fact finding to help with future ACNP exam preparation. Examinees are allowed 3-1/2 hours to complete the test, which allows just over 1 minute per question. ACNPC Flashcards. 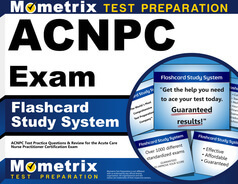 Proven ACNPC test flashcards raise your score on the ACNPC test. Guaranteed. Approximately 50% of the ACNP exam focuses on clinical decision-making and is divided amongst the various body systems. The remainder of the ACNP exam focuses on principles of patient care from a nurse practitioner standpoint along with issues of diversity and collaboration for patient care. Recertification must be performed every 5 years in order to maintain current Acute Care Nurse Practitioner certification. There are certain requirements that must be met in order to renew the ACNP certification. The ACNP must have worked in their specialty for at least 2,000 hours over the past 5 years with at least 400 of those hours being in the previous 1 year before certification renewal. An alternative to taking the ACNP exam over again would be to acquire at least 150 continuing education (CE) credit hours through education materials. These are available through literature, lectures and conferences, or teaching in the classroom, or through professional journal writings or editing.